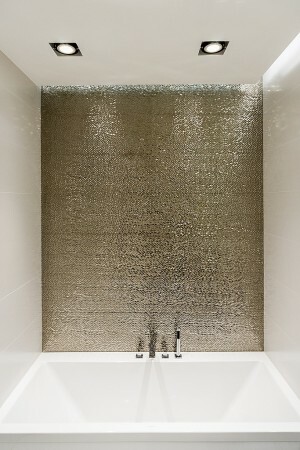 Who says that bathrooms have to be plain and boring? This area of your home is used countless times per day, making it one of the most important spaces in your home. 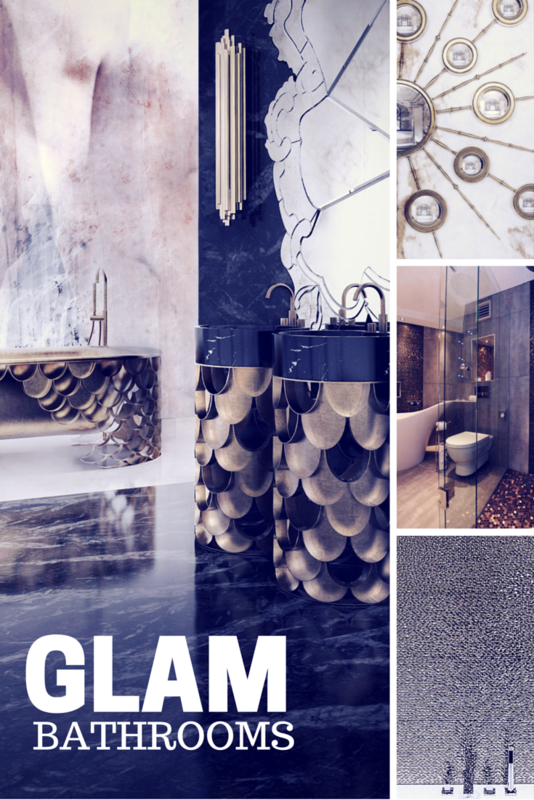 Forget dull colour schemes, drab patterned tiles and uninspiring accessories – let’s liven up our bathrooms with plenty of glitz and glam. 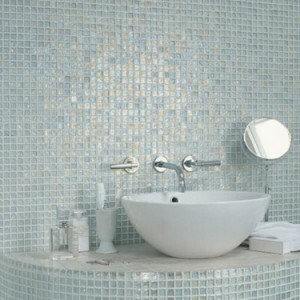 Create a bathroom fit for a diva! 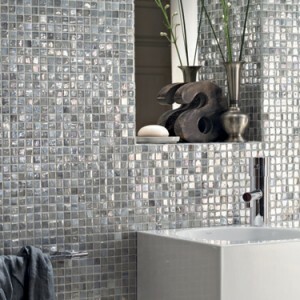 Transform your bathroom by installing shimmering tiles. We love the glittering gold wall (below left) by Polish interior designers Anna Maria Sokołowska and Marta Piątkowska from Dragon Art. The second bathroom (below right) features a glittering mosaic of copper and bronze tiles, plus a coordinating panel on the wall. The overall effect is luxurious. 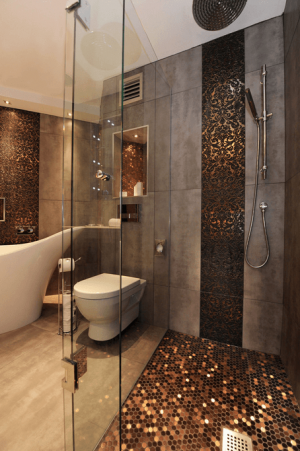 Overhauling your WHOLE bathroom is quite a big commitment, but simply changing your bathroom tiles is a quick and easy way to give the space a much-needed update without causing too much upheaval. Go big or go home with your accessories. Choose the most opulent fixings that you can afford and don’t skimp on the details. 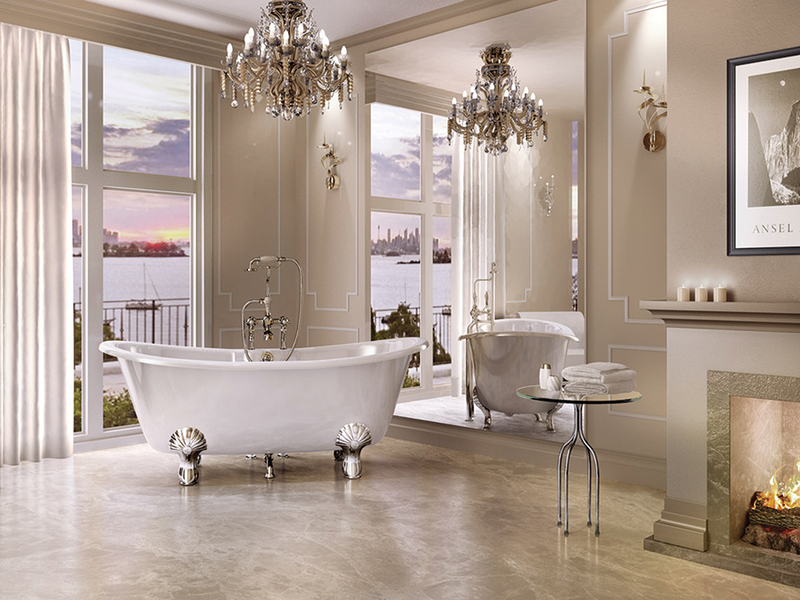 In the photo below, the chandelier captures your attention, but then your eye is drawn to those stunning feet on the bath. Gorgeous. Below left, the gold and white washbasins are spectacular on their own, but the dramatic mirror adds impact. 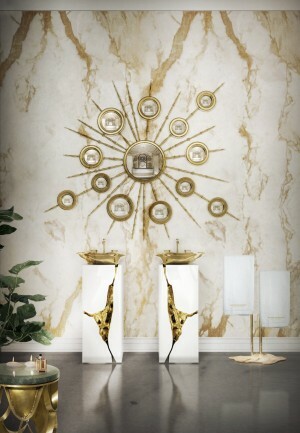 Below right, the gold basins and bath are eye-catching. The wonderful design is inspired by koi carp. 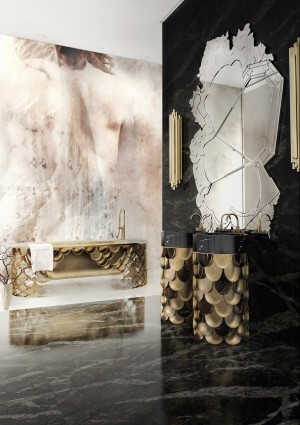 Both bathrooms use statement pieces to achieve an overstated, maximalist feel. Any interior designer will tell you that great lighting is key in any room. The brighter the better. Think beyond the boring bulb in the centre of your bathroom and consider investing in unusual solutions. Think ceiling spotlights, interesting wall lights, dramatic installations (below right) and cabinets that light up (yes they exist – perfect for when you’re getting ready for a night out on the tiles). One final tip: don’t be afraid to use large mirrors to bounce light around the room. 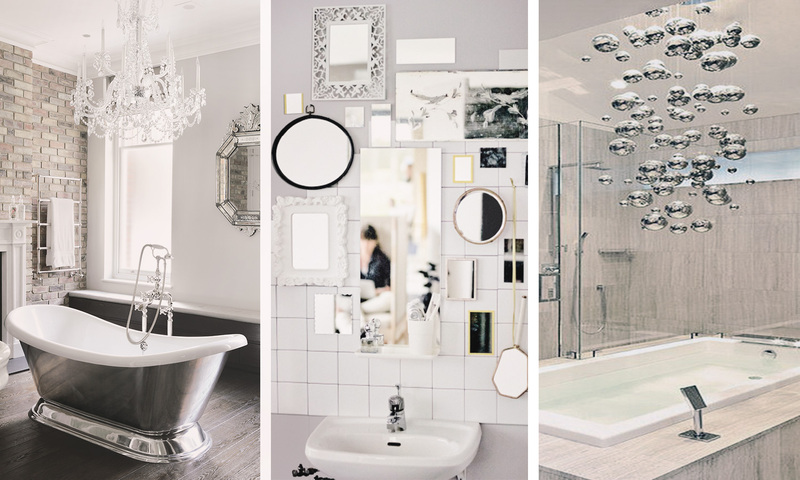 We love how IKEA have created a gallery wall using an eclectic mix of mirrors. Stick to ornate detailed frames to create something similar in your bathroom. Thanks for stopping by Mary Beth. I’m pleased you like the mirror wall gallery. Awesome pics, illuminating lighting and chandelier idea is the best. All bathroom photos are very amazing. Thank you! Sadly, I only curated them. But I’m pleased you like them.